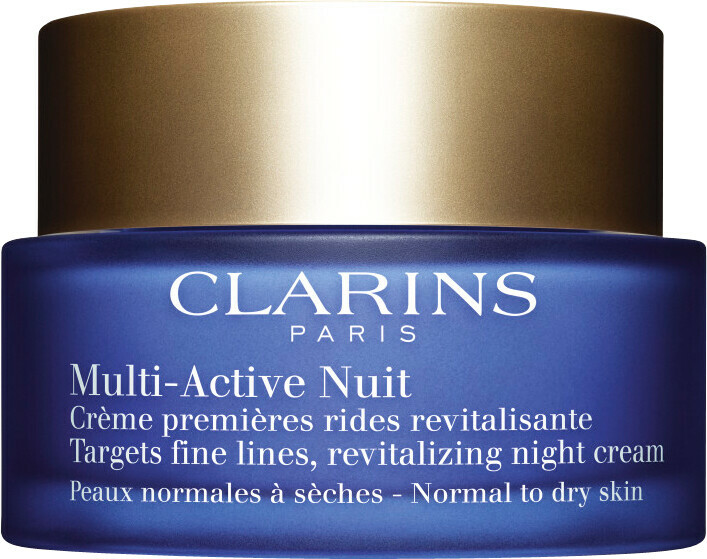 Help skin to recover from the stresses of daytime hours with the Clarins Multi Active Night Cream for Normal to Dry Skin. The reformulated night-time skincare solution now contains golden poppy extract, which neutralises oxidative stress caused by a lack of sleep and encourages skin to repair itself. Especially effective for dry skinned women around the age of 30, the Clarins Multi-Active Night Cream boosts cellular renewal at a time when skin renewal is at its optimum pliancy and efficiency. The cream’s indulgent new texture contains evening powders to refine the skin’s texture, helping to reduce wrinkles and fine lines. Apply in the evening to a thoroughly cleansed face, smoothing the cream gently without tugging. 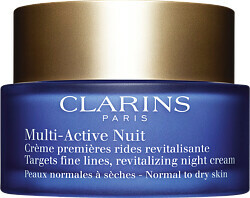 Clarins Multi-Active Nuit Revitalizing Night Cream - Normal to Dry Skin 50ml is rated 4.9 out of 5 by 19. Rated 5 out of 5 by JustJules from Fantastic Night Cream Having finally decided I need to use a night cream and only ever use Clarins cream for my face I took the plunge - and wasn't disappointed. I think I would prefer a lotion, but this is quite lovely and early days are showing good results. Easy to use, gorgeous fragrance and has the Clarins touch for my sensitive skin. Rated 5 out of 5 by ChrissieB from Wouldn't be without this night cream now. Lovely stuff! Rated 5 out of 5 by Angeldust from Fabulous I use this after my Santal oil in the evening. My skin is brighter and hydrated through the night. I love the lightweight consistency with this cream. Lovely fragrance not too strong. Wake up with glowing skin everyday.